Time for outdoor skating! Here’s some tips! With spring FINALLY arriving in my neck of the woods, I managed to get out for my first outdoor skate. I thought I would take some time to share my outdoor tips (and I encourage you to share as well) because this is how most of us Dames got our training last summer when we had no access to venue space. Be aware of wet areas on the paths and roadways. Not only does wet pavement cause your wheels to slide out when you push, moisture can ruin your boots and wreck havoc on bearings. Moisture inside your bearings can cause them to rust and stop spinning effectively. Avoid puddles at all cost and if you happen to hit the odd splatter, dry off your skates and bearings as soon as you are done your skate. Durometer (the “A” rating): Ranges from 74A to 105A. The lower the number, the softer the wheel. Wheel durometer affects durability, shock absorption and grip on surfaces. 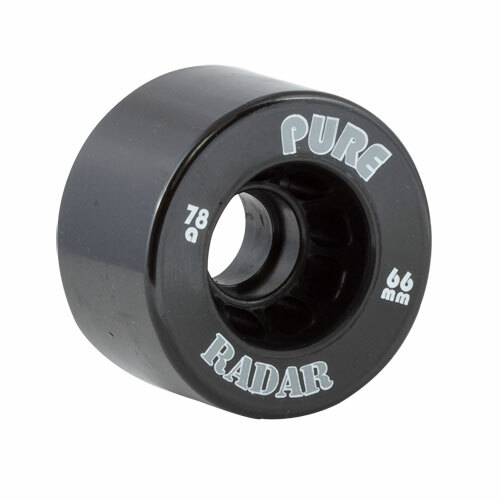 For outdoor wheels having a lower durometer helps absorb the little bumps in the pavement and also kicks little rocks out from under your skate. Ever hit a peddle on a harder wheel? Not fun. Lower is best. Size or Diameter: This is the height of your wheel. Shorter wheels are slower and more maneuverable while taller wheels give a smoother ride and are a faster. Choose a size based on how fast you’d like to skate outside. Width: The narrower the wheel, the more maneuverable it is. Also keep in mind narrow wheels are less stable for new skaters, so don’t choose something that’s too narrow for your skill level. These glide SO smooth on rough asphalt and can handle minor gravel. These are wicked fast too. Check out the Rollergirl.ca website, for many options of outdoor wheels. Switching bearings between your indoor and outdoor wheels can be a pain and you also risk damaging them over time. A second set of bearings to leave in your outdoor wheels is highly recommended. Some gals use their old bearings for outdoor skating so they don’t really care if they get them dirty or wet. But there are some bearings on the market that are fully encased, making it more difficult to for dirt and moisture to get in. These are pricey, but if you don’t like taking apart your bearings and cleaning them, it may be worth the money. If you don’t have a roller skate shop near you, you can go to your local skateboard shop and talk to the crew there. Skateboarders are just as hard on their bearings (even harder because they almost exclusively skate outside) and they should know which ones will be best. Don’t forget, if you get your bearings from a skateboard shop, you’ll have to buy 2 boxes worth. You can also buy bearing guards which can help keep dirt and debris from entering your bearings. Google that to find available options. My oldest bearings go in my outdoor wheels and I wear them until they lose their spin. You can also purchase wholesale industrial 8mm bearings for a decent price. Surf the interwebs for a dealer near you. Yes, you will get second glances when you go out skating in full gear. You might even get laughed at. Who cares! You are not skating on a smooth, predictable surface anymore. As some gals can attest it only takes a rock, a pedestrian or even a curb to get in your way outside. There is nothing worse than bashing your knee during a pleasure skate that keeps you from practice or injuring yourself in a way that keeps you from your job. Don’t be stupid. Gear up. Especially if you’re going out to get your sweat on. But do your league a favour and wear your team shirt. You may drum up some new recruits or fans while you’re out and about. Recommended: I have a summer set of knee, elbow and wrist guards. They are a bit lighter than my derby set so it’s not so hot to wear when it’s +30. I use these for casual skates. 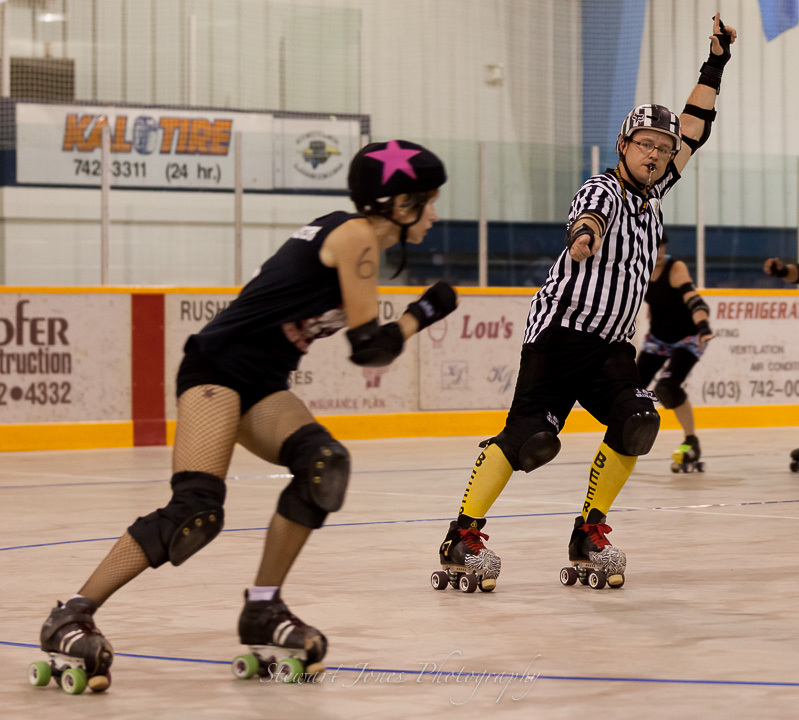 I often go without elbow pads for casual skates as well and on rare occasions, sans helmet. On days when I’m skating for training, I will do full derby gear, as I have had some pretty awesome spills when I get my speed on. You’ll get tan lines from wearing your gear in the summer. Just accept it. Rookie mistake when skating outdoors (and in derby): coasting on two feet and locking your knees. There is nothing worse than face-planting in public. The best way to avoid falling is to always have your feet in motion by step skating. Why? If you’re on one foot and lose your balance or hit a rock that jostles you, you can put your other foot down to regain your balance. If you’re afraid to pick up your feet and coast down trails with intermittent pushing, your face will break your fall if you lose it. For the love of derby gods, pick up your feet! Your knees are your shock absorbers and if you hit debris while your knees are bent, your body is in the perfect position to absorb and/or react if you stumble. Locking your knees or standing up straight impedes your ability to react and will cause your body to ‘tip’ instead of ‘absorb’ if you hit a rouge pine cone. Keeping fluid by bending your knees will keep your upper body relaxed as well. But remember to keep your hips and shoulders square and core tight to maintain your balance. The vibration from skating on a bumpy surface will reverberate into your feet and up into your legs. It may cause your feet and/or shins to get tingly or even burn. Softer wheels will lessen the sensation. But the more you skate outside, the more you will get used you it! Skating slow on a bumpy surface will have your upper body lurching forward every time you hit a larger crack or debris because you don’t have enough speed to go over it smoothly. Always skate within your skill level, but understand that a sidewalk crack may cause you to stumble forward if you don’t have the momentum to go over it – like a car needing momentum to go over a speed bump. If you have a stable skating stance with bent knees and are picking up your feet, recovering from those stumbles will be easier. As you skate on different outdoor surfaces, you will learn how to adjust your momentum to surface with little lurching. Stop. Then step down/up from them using your toe stops to help stabilize yourself, then continue skating. Build your confidence in stepping on/off curbs at a stand still and work up to navigating them while rolling. Remember that roads are curved toward sidewalks so water runs off into storm drains. Be sure to compensate your body position to keep your balance. No matter your skating ability, always slow before entering an intersection so you can stop quickly if oncoming traffic doesn’t give you the right of way. For the beginner, skating outside can be pretty intimidating. But I found my stability increased much faster by skating lots outside. Learning to negotiate gravel, pine cones and road intersections forces you to be aware of your surroundings and makes you pick up your feet… both good skills for a beginner. Plus navigating curbs makes you do little hops and steps that are common in pack work. If you can find a clean parking lot or abandoned stretch of road to skate around on, that’s fabulous. For me, I really enjoy skating for endurance. The longer the path the better. Try this: Map your favourite routes using a Google map or use an app on your smart device to record distance and speed of your outdoor skates. If you have kids, push them in a stroller/chariot or push them while they ride a bike to add fun and fitness. Here are some of my favourite trails around Lethbridge. But there are many, many more. 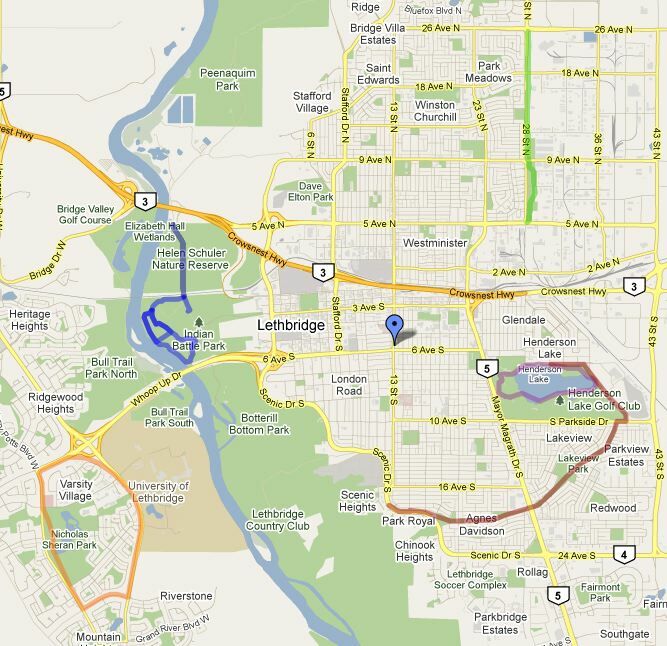 You can access the Lethbridge pathway map by clicking here. My favourite skate routes. Google will map the distance as you draw the routes. Or use a fitness/motion app that tracks your speed and distance as you skate. Great for beginners. Very few intersections to navigate through. Gradual hill climbs and good opportunities for fast skating. Blue route: Indian Battle Park riverbottom – loops range from .5 mi or .7 km to 3.55 mi or 5.71 km. Also has stairs for dryland training. Great area for variety – lots of paths to choose from. Good for beginner/intermediate. Some short hills, but are easily avoidable if you’re not comfortable with speed. Surfaces vary from super smooth to bumpy. Lots of pedestrians, dogs and kids to watch out for. Debris from trees can cause hazards on windy days and is prone to flooding during rainy season. Great on hot summer days because of the shade from trees. A nice cruise. Good for beginner/intermediate. Road intersections should be handled with caution, as some don’t have smooth transitions. Paths are generally clear but watch for gravel and pine cones. There are some sections where the path is terrible, but they are short-lived. Some short hills and opportunities for speed. A fun trail if you want to be seen by everyone! Make sure you take the trail furthest from the north side of the lake for the best ride (avoids most of the cobblestone path). Adjust your speed based on pedestrian traffic. These trails tend to be very busy. Keep to the right and announce to pedestrians what side you are passing on when you come up behind them. Cool air from the lake keeps you cool on the hottest of days. Flat, smooth and few intersections. Great for a beginner. Very little debris except at intersections. Better on weekends due to decreased industrial traffic. Very little shade. Not recommended on hot days, great for early morning skates! This leads to new trails in the far north side of the city. There are tons of new path systems in newer neighbourhoods that aren’t on this map. Go and explore! So for those who are about to venture into the out-of-doors, I hope this helps a bit. I would love to hear from others about your favourite wheels, bearings or gear you use outside. No more excuses, freshies! Get out there and skate your asses off! The weather turned kind of crappy when I got home so thoughts of skating after work were kiboshed. Instead I took my oldest boy out to the 2 skate shops in town, Bert and Macs, then Walmart for shopping for new pads. My current knee and elbow pads are pretty cheap (they’re my kid’s actually) and don’t fit me well so wanted something a bit better. Thanks to a tip from one of the girl’s on Sunday, she saw some Tony Hawk pads at Walmart for $20. After coming up empty handed at the other stores (one didn’t have their stock in yet and the other recommended to check some product on http://www.redprotection.com which they can order in) I decided to go with the $20 set until I really know what I want and need. I decided my current wrist guards will suit me until I talk to one of the girls to see if they will be okay. I consider myself lucky because I already have the skates and helmet. A lot of these girls are having to put a huge amount of coin for equipment before getting started. Wheels and bearings, however, I may have to invest in. The knee pads are great! Very comfy and they fit my skinny legs. My elbow pad straps will need to be altered a bit so they fit tighter. I’m very happy with my purchase, but debating if I should rip off the Tony Hawk label and customize the knee pads with something more fun. Snow is in the forecast. Ugh. I just want to SKATE!